Font clean up and Unicode updates are slowly coming along. I'm still have writer's block, but chapters of my baybayin book already got more info (in my head) since I started getting and reading old books and manuscripts from the 1600s to the early 1900s. I'm studying more about modern Filipino orthography to better understand and create new proposed rules on modern baybayin. I think I finally broken down every character/glyph to it's basic elements and have a standardization solution. I will write down the proposed rules and theories in my book. I have many new Baybayin and "Alibata" fonts in the works. BTW, I am using the term "alibata" now to categorize baybayin fonts that are not styled after native Asian and Indic scripts; this will include Arabic Kufic & Western styled fonts and fonts that include expanded consonantal characters like those seen on Bayani Mendoza De Leon's manual (See example @ Christian Cabuay's site). Bear in mind that other than my stylized "Da" for "Ra" and open/closed kudlit or proposed markers, I will not add other new characters deemed unnecessary to my fonts (this means that I wont be making very many "alibata style" fonts). 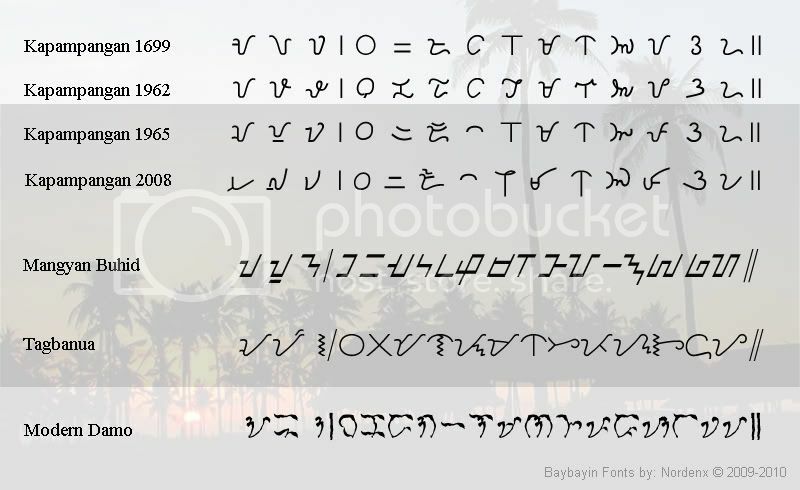 Artistically stylized characters like fantasy, techno, floral, or horror fonts will remain categorized as modern baybayin as long as the character or glyph shapes are not based specifically on western typefaces and do not have "expanded" characters. This means that BMF Block, even though uses Blackletter style is still categorized under "baybayin style" since the character shapes are in essence retains the traditional forms. I found out, while developing the Baybayin Typepad app, that glyphs or parts of them that are not welded or joined together in will actually show any overlapping parts if you set the font antialiasing above normal range. My immediate goal before I released any more fonts is to fix these characters in all my released fonts and update all of the download packages. (This is what I get for my laziness) I apologize for my sloppy mistake, after updating the individual zip files I will also package all the updated set into one zip file bundle so that you don't have to download most of them one by one. Another thing I just noticed is that the Wikipedia entry, which uses unicode to display baybayin script, is actually using the reserved Tagalog Unicode address $170D to display "Ra" ("Da" really, duh!) - this is news to me since the current unicode chart for Tagalog still doesn't have a "Ra" and $170D is still on reserve. 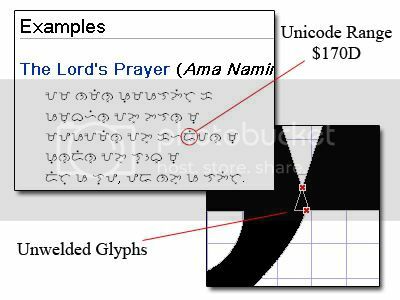 I failed to notice the Wikipedia use of $170D until my recent hard drive crash, when I revisited the site without the most basic baybayin fonts (Quivira & Morrow) and it showed the 170D marker for all the "Ra" entries on the examples. 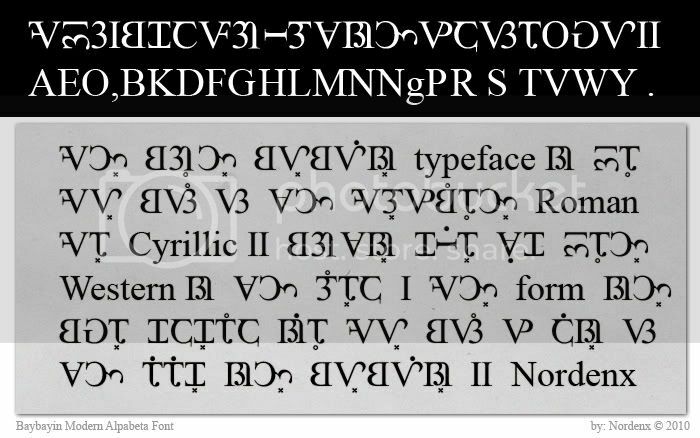 Nevertheless, as you can see on the image above, I have begun integrating my "Ra" character onto the $170D address on all my fonts. This will be part of my next font update release. 1) Kapampangan 1699 script is based on what is printed in the book Vocabulario de Lengua Pampanga by Alvaro de Benavente published in 1699. 2) Kapampangan 1962 script is based on what is compiled in a typed-written book of Kapampangan writer Zoilo Hilario's work entitled Bayung Sunis, published in 1962. 3) Kapampangan 1965 script is based on what is included this in renowned Kapampangan historian Mariano A. Henson's general list of Kapampangan characters in the final edition of his book Pampanga and Its Towns, published in 1965. 4) Kapampangan 2008 script is based on the modified version of the general list of characters presented in the primer Pamagkulit king Kekatamung Matuang Kasulatan written by Michael Pangilinan, published in 1989 by the Akademyang Kapampangan and later in Siuálâ ding Meángûbié (1995, 2002, & 2008). More info on Kapampangan: Siuálâ ding Meángûbié website and Michael Pangilinan's paper. 5) Mangyan Buhid and Tagbanua are based on the Quivira.ttf entries but made to be easily accessed by regular keyboards just like my Mangyan Hanunóo font. 6) Modern Damo is a horror or scary style font based on dried grass formations, the kudlits on that font has a floral look.